Can a Company Legally Cut Your Pay or Hours? Can a Company Cut Your Pay or Hours? Is it legal for an employer to cut your pay or your hours? In many cases, the answer is yes. The amount you make and the hours you work aren't guaranteed. If you aren't protected by an employment contract or bargaining agreement, your employer can reduce your salary and your work schedule at any time, with some limitations. What is a Pay Cut? A pay cut is a reduction in an employee's salary. Pay cuts are often made to reduce layoffs while saving the company money during a difficult economic period. A pay cut may be temporary or permanent, and may or may not come with a reduction in responsibilities. Some pay cuts also affect an employee’s raises, bonuses, and benefits. When Can a Company Reduce Pay? Your employer doesn’t need a reason to cut your pay or reduce the hours you are scheduled to work. Unfortunately, employers can, in most cases, cut your pay or reduce your hours since most employees are "hired at will." Employment at will means that when workers don't have a formal employment contract or are covered by a bargaining agreement they can be terminated, demoted, and have hours reduced or pay lowered at the company's discretion. A pay cut cannot be enacted without the employee being notified. If an employer cuts an employee’s pay without telling him, it is considered a breach of contract. Pay cuts are legal as long as they are not done discriminatorily (i.e., based on the employee’s race, gender, religion, and/or age). To be legal, a person’s earnings after the pay cut must also be at least minimum wage. 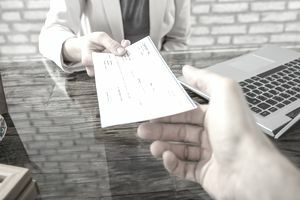 Workers with individual employment contracts or protections under union contracts are typically shielded from salary or wage reductions during the periods covered by those contracts. In those situations, an employer cannot arbitrarily cut your pay or change your hours. If you're an employee who isn't protected by a bargaining agreement or employment contract, there is no set amount that you have to be paid. However, employers cannot reduce wages to a level which is lower than the minimum wage in their state. The federal minimum is $7.25 per hour. Some states have a higher minimum wage than the federal minimum. Here's a chart that lists the state minimum wage rates (2019). There are some exceptions to the minimum wage rules, but you cannot be paid less than the minimum wage rate for your classification in your state. When employers reduce wages, they are required to do it in an equitable manner. Companies cannot target workers for wage reductions by race, age, or any other protected class under discrimination statutes. Wage/salary reductions for reasons that are in opposition to public policy are also not legal. For example, an employee's hours or salary cannot be cut for taking time off for jury duty, to serve in the National Guard, or for whistle-blowing regarding an employer's actions that are harmful to the public. Are you anticipating a reduction or pay in hours? If your employer does cut your pay or schedule, you’ll typically receive a letter outlining the change. The letter will likely explain that there will be a pay cut, with details of how much salary will be reduced and when the reduction will go into effect. As you are aware, the recent economic downturn has adversely affected Broadway Inc. To increase cash flow and limit layoffs, the company has decided that salary reductions are necessary at this time. We are asking all employees to accept an 8% pay cut. The executive staff has already taken the same pay cut. We are asking to reduce your monthly salary from $4,000 to $3,680 beginning one month from now. Your current position and duties will remain the same. During this period, we will continue to monitor the company's financial situation. If the economic situation and the company's performance improves in the next two quarters of the year, your former salary may be restored. If you decide to decline this reduction in pay, you will be removed from your position effective one month from today, with severance pay. We appreciate all the hard work you have put into your position at this company, and we do not want to lose you as an invaluable employee. Your understanding, support, and co-operation to help Broadway Inc. endure the current economic situation is greatly appreciated.